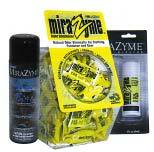 Mirazyme is a unique odor eliminator that works with an all-natural microbial formula. Ideal for clothing, wet suits, dry suits, life vests, tents, backpacks, waders, rubber boots, boot liners, foul weather gear, hockeygear, orthapedic supports, sport sandals, athletic gear, neoprene gloves & booties and long underwear. Use on Polar Fleece, bivy sacks, B.C.D.s, boots, marine galleys and heads, fire and safety gear, farm gear, insoles, protective helmets and much more. Penetrates into the pores of fabric, rubber, and even hard sufaces to eliminate odor naturally. 1/2 oz. Travel Pack, 2 oz., 8 oz.